A different take on Ethiopian coffee at Make contrasts with the coffee ceremonies of Addis Ababa. And makes me think about coffee in general. This morning I went to Make Business Hub for a coffee morning. Not a coffee morning with gossip about family and work, but a coffee morning dedicated to, well, coffee. It was hosted by Matt Wade, of Coffee Planet Roastery, whose business card reads “roast master”, a coffee expert. He was showcasing one coffee, an Ethiopian roast, that had lemon hints, and tones of chocolate and caramel. 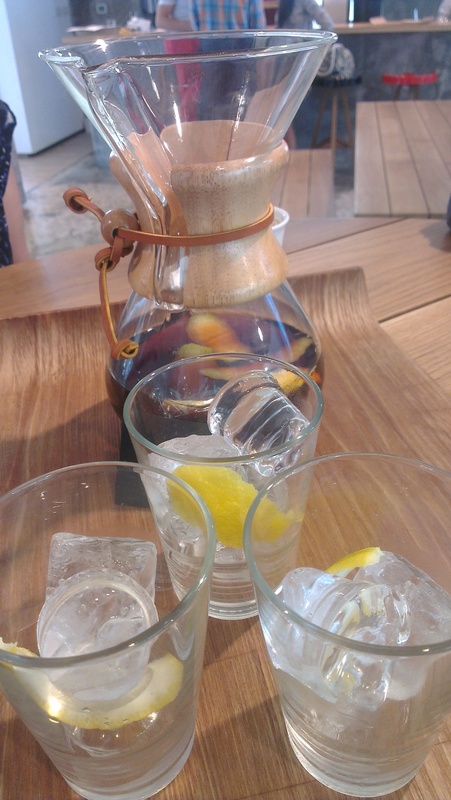 He filtered it into a large decanter that looked like it had been taken from a chemistry lab, added some lemon peel to it, and a bit of sugar syrup “to balance it”; that is, to bring out the chocolate tastes. It was served poured into a glass with ice and a slice of lemon peel.